Stephen Schwartz’s hit Broadway musical Wicked has been enchanting audiences across the globe for more than a decade and has come to the Edinburgh Playhouse for an eight week spell this winter. In a witty and wonderful re-imagining of the world created by L. Frank Baum’s classic novel The Wonderful Wizard of Oz, the musical depicts the untold story of Elphaba, the future Wicked Witch of the West. It begins with her attendance at Shiz University, where she meets fellow student Glinda ‘the good’. With their relationship at the heart of the plot, audiences are captivated by the tragic rise and fall of the ill-fated Elphaba, as the play explores the discourse created when immovable idealism meets unstoppable opportunism. Based on Gregory Maguire’s 1995 novel, Wicked: The Life and Time of the Wicked Witch of the West, the play carries on from the end of the 1939 film The Wizard of Oz as the masses rejoice at Dorothy’s heroic destruction of the Wicked Witch of the West. Good witch Glinda then appears, taking-off into the analeptic exploration of the villain’s rise to infamy. The mysteriously green Elphaba then takes to the stage, wide eyed and innocent on her first day at Uni, where she stumbles into Glinda in full brattish, adolescent swing. The two girls room together, setting up the friendship which ensues. Their journey through schooling takes them to the stunningly garish Emerald City, to meet the fabled Wizard. Initially believing that she has finally found the place of acceptance she’s always dreamed of, Elphaba’s joy turns to ash in her mouth as she realises that the powers that be mean to manipulate her magical prowess in the propagation of their sectarian state. In refusing to accept this plot, she is labelled an enemy of the public and the witch-hunt ensues. Elphaba’s emphatic thrust into the hearts of every viewer made the pre-interval finale the highlight of the show, with the reaction to Defying Gravity shaking the foundations of the Edinburgh theatre. Yet, from then on, the show seems to play catch up to the well-known storyline of the novel and movie, allowing the plot to take a backseat as it attempts to juggle character references, everything which had taken place in the first act and the main character’s plummet into darkness as she loses all hope. Her despair is effectively portrayed through both song and dialogue, but seems a far cry from the events just half an hour previous. By the time the momentum of the story levels out, the two main characters are already saying goodbye “For Good”. Wicked takes a thematic approach to the victorious as the author of history in its telling of this fantastical underdog story. 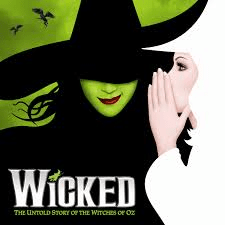 Its award winning score and the electrically engaging performances of Ashleigh Gray’s Elphaba and Emily Tierney’s Glinda initially arrest all previous knowledge of the protagonist’s shady future. Their on stage relationship creates a chemistry which unwittingly increases the audiences understanding of the polar-opposite motivations of both characters. As Elphaba strives to be seen for the person she is underneath her emerald exterior, Glinda struggles to choose between her closest friend and her wildest ambitions – and it is here that Tierney steals the show. Despite the Wicked Witch’s picture being on the poster, the unfathomable depths of Glinda’s shallowness and superficiality immediately evokes childhood memories of Verruca Salt demanding a golden egg. However, it didn’t take long for the audience to get onside. That isn’t to say that Gray’s performance didn’t strike a chord; three separate roaring ovations from the crowd in the first act alone testified to her choral prowess. With a voice to rival Idina Menzel of the original Broadway cast, her performance of the popular Defying Gravity transcended the stage, raised up on high by the thunderous applause of a sold-out crowd. Posted in Arts and tagged musical, play, tour, wicked. Bookmark the permalink.